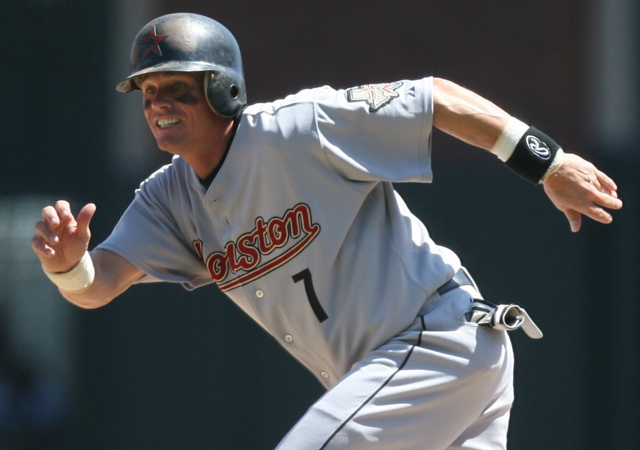 Craig Biggio was already an All-Star as a catcher, but when he moved to second base in the early 1990s, it changed his career and helped put him on the path to the Hall of Fame. The Hall of Fame's Class of 2015—Craig Biggio, Randy Johnson, Pedro Martinez and John Smoltz—will be inducted in Cooperstown on Sunday, July 26, and in their honor, we're reaching into the SI Vault for features on these all-time greats. Today's pick: Michael Bamberger's April 1, 1996 feature story on Biggio, who was in the midst of a run in which he made seven All-Star teams in eight seasons. Craig Biggio leads the sort of idealized life that one associates with black-and-white TV. He calls his father-in-law Dad. His wife, Patty, is attractive and vivacious, and she knows where everything is. (She studied nursing in college, but now she's a full-time mom.) Craig and Patty have two young boys, Conor, 3, and Cavan, 11 months, who bounce around happily in the morning and take long naps in the afternoon. Shelbee, the family mutt, is a good sleeper too, and she knows all the warm spots in the house. The house itself—in the charming, sea-battered town of Spring Lake, on the New Jersey shore—is a timeless, fixed-up beauty with an appropriate name, Home Plate, a view of the ocean and the comforting proximity of millionaires. The Biggios are doing all right themselves: Over the winter, Craig, a sure-handed–free-agent second baseman with light feet and a peppy bat, agreed to stay with the Houston Astros for at least another four years, for at least $20 million. He's 30, a man, but he looks boyish, like Kevin Bacon in Diner. In the off-season, Biggio is home most nights for dinner; Patty's a good cook. For lunch, he heads into town. He pops over to Spring Lake Pizzeria, on Third Avenue, or to Joseph's Delicatessen, near the train station. At Joseph's, the regulars still actually talk baseball, mostly New York Yankees baseball. "You gonna sit down or what?" Joseph asked one morning in January. Biggio was eyeing the salads and meats and cheeses. "Can't. Going out to the Island," Biggio answered. He grew up in Kings Park, N.Y., a middle-class commuter town on the north shore of Long Island, and he was about to go home again, to visit his youth. He ordered a tuna sandwich to go. "He coulda been a Yankee," Joseph said, to nobody in particular. "I don't know," said Biggio, who was a first-round amateur draft pick of the Astros in June 1987 and was in the majors to stay a year later. "I'm kinda happy in the National League." He grabbed his sandwich, waved good-bye, and he was off. At Joseph's, they know the Yankees figured prominently in Biggio's baseball development. While he was growing up, his idol was Thurman Munson, then the Yankees' catcher. 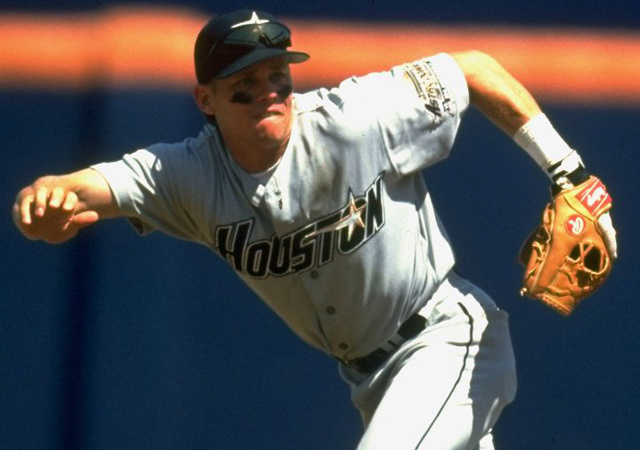 Biggio broke into the majors as a receiver, even went to the 1991 All-Star Game as a catcher. The next season, he migrated to second and made himself, many baseball people think, the best defensive second baseman in the National League. "Around here, it's always, 'When you gonna play for the Yankees?'" Biggio said, without a hint of complaint. He was now behind the wheel of his Chevrolet Suburban, big and white, with Texas plates. Biggio, a righty, handled the wheel with his glove hand as he released his sandwich from its wrapping with his throwing hand. "On the Island, you get, 'When you gonna sign with the Mets?'" Coming off a 1995 season in which he batted .302, had career highs in home runs (22) and RBIs (77), and led the majors with 123 runs scored, Biggio was one of the winter's most sought-after free agents. Before re-signing with Houston, he had a brief flirtation with the Yankees and a longer one with the Mets, plus serious talks with the Colorado Rockies, the St. Louis Cardinals and the San Diego Padres. The Astros didn't offer him the most money, but Biggio signed with them anyway. Maybe some New Yorkers just don't want to play in New York? Biggio shrugged. "New York's tough, no question," he said, steering north on the Garden State Parkway, heading for New York City. "The thing with me is that I want to finish what we started in Houston. I played on some rebuilding teams, tough years. In 1994, we were good—we were right there—but then came the strike. Last year, a lot of our players got injured. I want to show we can win in Houston. "That's from my father. He'd always say, 'Finish what you start.' In ninth grade, I didn't want to play baseball. I was more into football. The baseball team was bad, and the season had started, and I wanted to quit. My father said, 'You finish what you start.'" As he drove, Biggio fiddled with a radar detector overhead. Next to it, attached to the sun visor, was a dried strip of palm frond, knotted in the shape of a cross, a Palm Sunday gift from Biggio's father-in-law. Biggio is a devout Catholic, but he wasn't born to it. There are Catholics on the Biggio side, but both his parents were raised as Protestants and so was Craig. In college, at Seton Hall, a Catholic school in South Orange, N.J., Biggio—upset by his parents' emerging marital problems and feeling spiritually unfulfilled—converted to Catholicism. It was also at Seton Hall that Biggio met Patricia Egan, of the New Brunswick, N.J., Egans. The Egans, Biggio says, are very Catholic. He likes the sense of family that Catholicism promotes. "Spring Lake's a Catholic town," Biggio said. "Big families." He was now on the Cross Bronx Expressway, a link between New Jersey and Long Island. As Biggio drove past the exit to Yankee Stadium, the conversation returned to baseball. "My father was a catcher in high school, and he got me started in baseball," Biggio said. "I liked catching because I wanted to control the game. I wasn't a Mets fan or a Yankees fan—I just liked to play—but the one guy I loved was Thurman Munson." In the Spring Lake house, in a part of the finished basement that could be an exhibit at Cooperstown, Biggio has one of Munson's bats prominently displayed. The bat has no knob on the bottom, and Biggio, a career .285 hitter, has used that style since his college days. Biggio was primarily a catcher at Kings Park High for three seasons and then caught at Seton Hall for three years, in the minors for two seasons and in the majors his first four years. At the conclusion of the 1991 season Astros manager Art Howe took Biggio to lunch. Howe asked him if he would be willing to move to second base. Lunch took two hours. "He said it would extend my career," recalled Biggio, who is listed at 5'11", 180 pounds but appears smaller. "He said it would help the team, let the team take more advantage of my speed, but he also said they weren't going to force me. I went home to Patty. We're a good team on making big decisions like this. She said to me, 'Do you think you can do it?' And I said, 'Yeah.' I wanted to do it because everybody said I couldn't. I'm stubborn." Biggio had had brief experiences playing the infield before, and they had not been good. Late in the 1991 season, a woeful year for Houston, Howe put Biggio at second for a three-game series against the San Francisco Giants, and Biggio felt as if he were serving a jail sentence in a foreign country. The summer before he started college, Biggio was making a rare appearance at second when his team's shortstop was struck and killed by lightning. After that, in college and in the minors and the majors, Biggio almost never strayed from behind the plate. "I felt like a Little Leaguer again," Biggio said, remembering his first workouts in preparation for the 1992 season. "That winter I spent a lot of time at an elementary school, taking grounders off a brick wall. I went to spring training with the pitchers and catchers, worked a ton with [third base coach] Matt Galante. He never made the majors, but he's a great coach. I'm like, 'What's this? No chest pad? No shin guards? This little glove?' At first he made me take infield wearing this paddle taped to my wrist. I had to stop the ball with the paddle. If you didn't stop it right in the middle of the paddle, it really hurt. I took about a thousand balls a day with that. Galante said it would develop soft hands. He was right. After I won my first Gold Glove in '94, I said, 'Matty, half of this is yours.'" According to the Elias Sports Bureau, Biggio is one of only two big leaguers ever to play at least 100 games at both catcher and second base. The other was Tom Daly, who played for five teams between 1887 and 1903, including 12 seasons with the Brooklyn Dodgers. Also, Galante should have a whole Gold Glove trophy by now: Biggio won the award again last year. Biggio pulled into the Kings Park High parking lot. It was midafternoon. After-school sports were starting. Biggio doesn't come to Kings Park much, not since his parents separated and left town almost five years ago. He entered the school, asked around for old coaches. Within minutes a dozen students had surrounded him. Biggio talked to them as if he were in high school himself. One kid asked him, "How good's your memory?" Biggio, challenged, said, "You gonna test it?" The high schooler raised the name of an old girlfriend of Biggio's, and Biggio smiled. He found his way to the corridor that houses the Kings Park Athletic Booster Club Hall of Fame. Biggio was the first inductee. Two custodians, Bob Woessner and Richard Weisse, were at work there. "This is my section," Woessner said. "I keep it nice and clean for you." "Looks good," Biggio said. "I haven't been here in a long time." "You've got a new life now," Weisse said. Biggio said nothing. He and Weisse were high school classmates. "What's that feeling like, when you're leaning back and you've got all those teams wanting you?" Woessner asked. "It wasn't as much fun as I thought it was going to be," Biggio said. He turned to his classmate. "How you doing?" "Getting by," Weisse answered. "I'm part time here, trying to get on full time. I've still got the landscaping business on the side, but there's a landscaper on every block now." Biggio spent another hour or so at Kings Park High. Walking through the locker room, he said, "See that smell? That hasn't changed." On his way out of the school, his conversation with Weisse lingered on his mind. "Sometimes, after you've had a little success, you forget how tough it is just to make a living," Biggio said, as he crossed the parking lot. "My father's an air-traffic controller. When we were growing up, he worked nights, weekends. Shift work. Long hours, trying to make ends meet, providing for his family. When I was a senior, the high school ran out of money for sports. To play baseball, you had to pay, like, $200. That was a lot of money for us. My father didn't bat an eye. You don't forget that." Biggio drove by the parks and along the streets where he spent his boyhood, down Westwood Lane and Colby Drive and Haig Place, grand-sounding names for unprepossessing roads that served Biggio as playing fields for stickball and football and street hockey. He drove by his boyhood house—neat and modest. After the separation his mother, Johnna, stayed in the house for a while; now she's in Oklahoma City, where Craig's older brother, Terry, also lives. Craig is close to Johnna and his two siblings; his sister, Gwen Sinkusky, lives in Inverness, Fla. His father, Gordon, settled farther east on Long Island. Biggio stopped around the corner from his old house, peered into his old backyard and noticed something amiss. "They got rid of the shed," he said. "My father built that shed. It was filled with shovels and wagons and hoses. Wonder why they got rid of it? It was a good shed." ​Biggio completed the journey through his boyhood—he drove along Main Street, went down to the waterfront, past the Kings Park Psychiatric Hospital—and he was satisfied. His life there was as he remembered it, for good and for bad. On the ride back to Spring Lake, he talked baseball. He talked about the genius of Yogi Berra, Biggio's coach in his early years in Houston, who taught Biggio not to make baseball more complicated than it is. Biggio talked about his particular skill at stealing signs as a base runner, and how a pitcher will make him pay for it the next time he comes to bat. He talked about the costs of the baseball strike and the work that must be done to make the game the national pastime again. He talked about the value of playing an entire career in one place, as Munson did. That's a value dear to Biggio. He said he learned the importance of commitment from his father. Gordon first went to work at MacArthur Airport on Long Island before Craig was born. He works there today. Craig was raised to understand the value of long-term relationships. Gordon's name came up often in conversation throughout this January day, yet it was a sensitive subject for Craig. Gordon has not seen his younger son for six years, except from a distance once or twice a season, when he buys a ticket and slips into Shea Stadium to watch Craig in an Astros-Mets game. After the game he heads home, without Craig's ever knowing he was there. He also watches Craig on TV and follows him in box scores. Craig leaned forward, rested his forearms on the steering wheel, stretched his back and exhaled. "My father's a stubborn man," he said. "He thinks my brother and sister and I sided with our mother in the divorce. His attitude is, 'You've made your bed, now you have to sleep in it.'" Gordon has never seen Cavan and Conor. Said Craig: "I've written him letters, saying, 'Who cares anymore who was right and who was wrong? You're my father, you're my kids' grandfather. We want you in our lives.' Nothing. I get back nothing." Craig rolled on, in silence, for a while. During a dinner stop, the name of Gordon Biggio was never mentioned. With his last bite of chicken, Craig glanced at his watch. He wanted to get home before his children went to sleep. The night was dark and cold. He pointed the Suburban for Spring Lake, for Home Plate. As he walked through the back door, Conor, in his pajamas, his skin pink from a warm bath, came running, yelling cheerfully, "Da-dee! Da-dee!" Craig Biggio grabbed his boy with his hands and raised him effortlessly until Conor was high in the air, way above sea level, giggling with delight.